Update: Per SCOTUSblog, the Chief Justice has asked the redistricting plan challengers for a response to the state’s application for a stay, due by 3 p.m. February 16. The fate of North Carolina’s congressional primary elections now rests with the U.S. Supreme Court, after the same federal three-judge panel that last week ordered lawmakers to redraw voting lines by February 19 refused late yesterday to stay that order pending appeal to the nation’s highest court. Finding that the state had little likelihood of success on appeal and that conversely the harm to state voters being forced once again to cast ballots under an unconstitutional plan was irreparable, the judges unanimously ruled in favor of challengers who’ve been trying for more than three years in state and federal courts to have the state’s 2011 redistricting plans invalidated. With that order, state officials quickly filed an emergency stay application with the Supreme Court. That application will go initially to Chief Justice John Roberts for review, as the justice handling emergency applications from courts within the province of the 4th U.S. Circuit Court of Appeals, but Roberts may then ask the rest of the court to join him in that review. In the meantime election officials are telling voters to keep voting absentee ballots, despite the panel’s order prohibiting the state from conducting any U.S. Representative elections until a new plan is in place. “There are a lot of contingencies that we don’t want voters to have to filter through – in a district for example that wouldn’t be affected by a redistricting effort,” Board of Elections General Counsel Josh Lawson said. “Our message was ‘vote it if it’s on your ballot,’ but the legal significance of that, whether or not we certify that, is still something that’s controlled by the courts,” he added. And Gov. Pat McCrory has announced the convening of a special legislative session next week for the drafting of a new congressional plan should the Supreme Court refuse to stay the panel’s order. 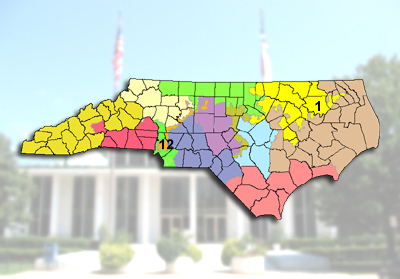 The challenge to the state’s congressional map is not the only federal case seeking to invalidate 2011 redistricting plans; a separate lawsuit directed at state legislative districts, Covington v. North Carolina Board of Elections, is pending before Fourth Circuit Judge James A. Wynn, Jr. and federal district court judges Thomas Schroeder and Catherine Eagles. That panel denied a request to stay the primary elections and has scheduled a trial in April. Both federal cases have been proceeding alongside the 2011 state court challenge to both congressional and state districts in Dickson v. Rucho. State Supreme Court justices, voting along party lines, have twice upheld the 2011 plans in that case, including most recently this past December after the U.S. Supreme Court sent Dickson back for further review in light of the high court’s decision in a similar Alabama case. The state court majority ruled both times that lawmakers correctly drew majority black Voting Rights Act districts without regard to the operative political facts there. The challengers in Dickson have asked the state justices to reconsider their ruling – a request that, if denied, will likely also head to the U.S. Supreme Court. Their argument — that under longstanding constitutional principles, and especially after the high court’s ruling in Alabama, lawmakers could use race to draw voting districts only where necessary to help minority voters elect their candidates of choice – largely aligns with the federal panel’s ruling last week. When drawing the voting lines after the 2010 census, though, state lawmakers used race without regard to necessity, moving more black voters into districts where such voters had already established political strength – Rep. G.K. Butterfield in the First District for example, and Mel Watt in the Twelfth — leaving more white voters in surrounding districts. In a strongly worded decision, the federal panel rejected the state’s approach as pretext. The prospects for an emergency stay may have improved for the state now that the challenge to congressional districts is before the U.S. Supreme Court, according to election law experts. “I think the Supreme Court is very likely to grant the stay even if, as likely, it upholds the judgment in this case on the merits,” University of California, Irvine School of Law professor Rick Hasen wrote in his Election Law Blog. That’s because the courts have been loathe to interfere with the election process once voting has begun, as it has here with absentee ballots already being cast for the March primaries. But earlier this month in a Virginia redistricting case, the high court did refuse to delay voting under a new congressional map issued by a federal district court there, rejecting the state’s prediction that widespread voter confusion would occur while the Supreme Court was continuing its review of that map on the merits. In that case, Wittman v. Personhuballah, a federal court had ordered state lawmakers to redraw its congressional map; when they failed to do so, the court redrew the map instead. Hasen said the critical difference between the Virginia and North Carolina cases is that voting has already begun here. But as Lyle Denniston at SCOTUSblog pointed out after the Supreme Court refused to delay voting in Virginia, the election cycle had begun there, with candidates already collecting signatures for nomination for the primary election. Absentee ballots won’t even be issued there though until late April, with in-person voting set for mid-June. Timing, as it turns out, might be the fatal flaw for the challengers of North Carolina’s redistricting plans. A decision by the Supreme Court on the stay application could come at any time and is expected before the end of the week. To read the federal judges’ refusal to stay it ruling requiring a new plan by Feb. 19, click here. To read the state’s emergency application for a stay to the U.S. Supreme Court, click here.